After two emotional wins earlier this week against the first place Prince George Cougars, you would think the Victoria Royals were in the perfect position Friday night for an emotional letdown. Unfortunately for the Kelowna Rockets and the 59 hundred patrons at Prospera Place, that didn't happen. The Royals dominated the opening period and were clearly the more physical team in a 2-1 win. The Royals set the tone earlier, physically, that if the Rockets wanted to win the game they would have to pay the price by getting to what the coaches call 'the dirty areas'. As a collective group, that didn't happen. The loss enabled the Royals to move within four points of the Rockets and Blazers for second place in the BC Division, while the first place Cougars have an 8 point cushion for first place after beating the Everett Silvertips 4-3. While Royals goaltender Griffin Outhouse was solid and was named the second star, the 18 year-old had a relatively easy night. 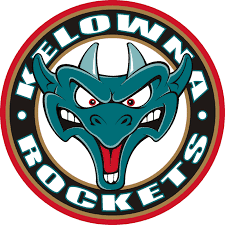 The Rockets had no where near the quality looks they had Wednesday in a 5-1 loss in Kamloops. The power play, despite scoring the lone goal, had a rough night. It looked fractured all night and it didn't look scary, even when the home team was awarded a second period 5 on 3. It was a rough night for the top six forwards, with no one player really standing out. The same could be said for the Royals top forwards, who were just OK in the one goal win. The Rockets five game home ice winning streak was snapped last night. The loss was the teams 7th at Prospera Place. Last season the team was defeated 6 times in front of the home town crowd. Royals Head Coach Dave Lowry says his team is trying to fly under the radar in the BC Division. "I hope everybody keeps talking about it being a three horse race for first place (Prince George/Kelowna/Kamloops). We are going to go quietly about our business". The Rockets are now 2-2-0-0 in the seasonal series against the Royals heading into back-to-back games on the Island January 11th and 13th. The Rockets have lost back-to-back games in regulation for the first time since October 4th and 15th when they lost 4-2 to Saskatoon and then 5-1 to the Swift Current Broncos. In the three games after the Christmas break, the team has scored only five goals. Of those five goals, four have been on the power play. The Rockets host Spokane Wednesday night before playing four consecutive games against BC Division based teams. The Rockets have a home and home series next weekend against Kamloops before back-to-back against the Royals. Earlier in the day it was learned that 19 year-old forward Calvin Thurkauf had signed a three year entry level deal with the NHL's Columbus Blue Jackets. Tonight’s Preview: The Kelowna Rockets play their final game of 2016 when they welcome the Victoria Royals to Prospera Place. This is the 4th meeting of the season between these two teams. The Rockets are 2-1-0-0, having beaten their BC Division rivals by scores of 5-1 and 6-4. In the last meeting, November 22nd, the Royals were a 6-2 winner. The Rockets visit the Royals for back-to-back games on January 11th and 13th. How closely are these two teams matched? In the last five seasons, the Rockets are 13-12-1-1 against Dave Lowry’s boys. The Rockets are coming off a 5-1 loss Wednesday night in Kamloops. Dylan Ferguson stole the game for the Blazers, making 46 saves. Nolan Foote scored the lone goal in the teams’ 13th setback of the season. Brodan Salmond took the loss in goal. Overall, the Rockets have won 4 of its last 5 games and have points in 5 of its last 6 games (4-1-1-0). That’s a fact Jack: At this point last season, Michael Herringer had appeared in just 14 games. This season he has played in 28 games…Fifteen different players have scored game winning goals for the Rockets this season….The team has scored 130 goals this season after 38 games. Last season, at this same point, the Rockets found the back of the net 139 times…The team has allowed 11 more goals at this point of the season than at the 38 game mark in 2015-2016….The Rockets have two out-right regulation losses in their last 10 road games. The team is 6-2-2-0 over that stretch…Four of the next 7 games will be played on the road. With back-to-back road games in Victoria (Jan 11th/13th), the team visits the Everett Silvertips for the first time this season on January 16th…The Rockets have allowed 10 goals against in their last 5 games…These two teams (Rockets/Royals) are a combined 32-0-1-0 when leading after 40 minutes…The Rockets are 12-3-2-0 in their last 17 games and have points in 12 of their last 14 (10-2-2-0). Top Prospects: Defenceman Cal Foote and forward Kole Lind have been named to the roster for the CHL Top Prospects game. Foote is one of only two players on the Rockets roster to play in every game this season. The other is Rodney Southam. Lind leads the team in scoring. The Top Prospects game will be played in Quebec City. Broadcasters Bits: Nick Merkley had two assists Tuesday to give him 150 for his WHL…15 year-old rookie defenceman Kaedan Korczak made his WHL debut Tuesday night vs. the Blazers. Korczak is the Rockets 1st round bantam pick from May…Calvin Thurkauf is the captain for team Switzerland at the World Junior’s…Rookie Erik Gardiner has 1+5=6 in six games with the Rockets since making his debut with the team in Medicine Hat before the Christmas break…Kole Lind had his 13 game point streak snapped December 18th against the Oil Kings. It is the longest point streak by a Rockets player this season …Calvin Thurkauf has 8 goals in his last four games and Monday was named the WHL Player of the Week for his antics…The Rockets are 8-2-2-0 in December...The Rockets were 6-4-0-0 in 10 games in November after going 8-4-0-0 in 12 games in October…The Rockets are the only team in the WHL that has failed to surrender a shorthanded goal against this season…The Rockets are 6-8-0-0 against BC based teams this season…The Rockets are 23-13-2-0 after 38 games. Last season the team was 27-9-2-0 after 38 games….Michael Herringer has started in 16 of the last 22 games and 22 of the last 29…The Rockets are 8-0-1-0 against U.S Division teams this season…The Rockets have carried the lead into the third period in 17 of the last 27 games while being tied three times over that period…The Rockets are the most penalized team in the WHL and have a league high 25 fighting majors…Tomas Soustal (Czech Republic) and Calvin Thurkauf (Switzerland) are playing for their respective countries at the World Junior Hockey Championships in Montreal/Toronto.…Dillon Dube became the 15th player in Kelowna Rockets franchise history to make Canada’s world junior team…January Birthdays: Devante Stephens (Jan 2nd), Jordan Borstmayer (Jan 9th), Riley Stadel (Jan 16th), Michael Herringer (Jan 26th). Who’s Hot? Lucas Johansen has a 4 game point streak (0+5=5)…Nolan Foote has goals in back-to-back games…Cal Foote has points in 7 of his last 11 games (1+12=13)….Jake Kryski has 6+5=11 in the last 8 games and 8+7=15 in his last 11 games..Kryski had 6+5=11 (1 shootout game winning goal) on this just completed road trip…Calvin Thurkauf has 8 goals in his last four games…Tomas Soustal has points in 12 of his last 15 games. The 19 year-old has goals in 10 of his last 18 games and has 10+15=25 over that period… Kole Lind has points in 23 of his last 27 games (16+23=39)…Lind has goals in 11 of his last 16 games.…Nick Merkley has points in 17 of his last 24 games (9+16=25). It was suggested that the Kamloops Blazers were in a heap of trouble when starting goaltender Connor Ingram was named to Canada's roster for the World Junior Hockey Championships. With Ingram out of the line-up for no less than 10 games, the Blazers would fall flat on their faces by being forces to use back-up Dylan Ferguson. The 18 year-old had other ideas. Ferguson was the second star Tuesday night in a 3-2 loss to the Kelowna Rockets and then made 46 saves Wednesday in a 5-1 win. Had it not been for Ferguson's stellar play, specifically in Wednesday's rematch, the Rockets would have extended their winning streak to five games. Instead, the Blazers moved within two points of the Rockets for second place in the BC Division with 34 games left to be played for both teams. Ferguson's best save came on a point blank chance when Rockets leading scorer Kole Lind found himself one-on-one with the Blazers goalie. With the home team leading 2-1, Lind lifted the puck up in an effort to fire it into the corner of the net. Ferguson flared out his glove to make a huge stop, denying the Rockets leading scorer of his 21st goal of the season. Shortly after that glorious chance, Jake Kryski also had a pin-point opportunity but appeared to miss the net. The Blazers would score on that same sequence when Jermaine Loewen went wide on Rockets defenceman Lucas Johansen and tucked the puck past goaltender Brodan Salmond to make the score 3-1. In my opinion, that was the TSN turning point. Had either Lind or Kryski scored, the Blazers would have been in a heap of trouble. It was just one of those nights in the offensive zone. The Rockets created 18 scoring chances which is a fairly high number. Only rookie forward Nolan Foote was able to find the back of the net with a sweet wrister on the power play that tied the score at 1. Foote now has 9 goals this season and arguably has one, if not the best release on the team. Nolan's older brother Cal was a workhorse on the blue line over the last two night's and logged major minutes. Cal seemed to play with more bite in both games and used his strength and body to punish opposing forwards. I thought he was terrific in both. Cal makes the fewest mistakes of any of the blueliners, has a booming shot and his body positioning is excellent. If he can play meaner, like he did in back-to-back games, I can't see why he won't be considered a top 10 NHL pick. I still think the Rockets take too many penalties, specifically at Sandman Centre. While it has only been two visits this season, players like Jake Kryski can't be going to the penalty box three times a game. Kryski isn't a physical player, and if it isn't a physical penalty, one stick foul per game, minimum, is acceptable. The fact is, the Blazers have had 16 power play chances in two games against the Rockets at Sandman Centre. That number should be cut in half, especially against a Blazers team that isn't that physical either. The best stick foul of the game came from Blazers forward Luc Smith when he had no choice but to hook Nolan Foote. With Ferguson out of position, the puck was in Foote's wheel house but he couldn't get a shot off because Smith, who was making his Blazers debut, was hooking him. Despite the loss, the Rockets didn't lose any ground on the first place Prince George Cougars. The Rockets remain six points back of the BC Division leaders, who lost back-to-back games in Victoria. It is official. Seventeen year-old Erik Gardiner will remain with the team for the remainder of the season. Gardiner, who started the season with the SJHL's Humboldt Broncos, has 6 points in 6 games with the Rockets (1+5=6) and has points in 4 of the 6 games he has played. Both teams were again playing short staffed. The Rockets welcomed Lucas Johansen back to the line-up after missing Tuesday's game with illness. In saying that, nine regulars (combined) were missing for both teams. With these two teams almost destined to meet in the playoffs, when every player is available, it should make for some excellent hockey. Lucas Johansen has a modest 4 game point streak going. The 19 year-old has 0+5=5 over that stretch. Nolan Foote missed the first 6 games of the regular season while he recovered from mono. Can you image what his goal total would be had he played in those games? Foote has 9 goals in just 26 games this season, which including missing an addition 6 games while playing at the Under 17's in November. Up next? A date with the Victoria Royals on Friday. The Rockets are 2-1-0-0 against the Royals after 6-4 and 5-1 wins. Combined, these two teams are 32-0-1-0 when leading after 40 minutes. Let's just say, having the lead going into the third period will be pivotal. Unbelievable. No, I am not talking about the fact I was able to wear only two different dress shirts over a span of 10 days on the Kelowna Rockets epic pre-Christmas road trip, it is the fact the team preformed without three of their top forwards, on one occasion four of their top forwards, and managed to pick up 5 wins, one loss in regulation time and suffered a single loss in overtime. The team generated 11 out of possible 14 points on a trip that had them, at one point, playing 5 games in 7 nights. The team didn't miss a beat. Honestly, they could have won all seven games had it not been for some average goaltending in Lethbridge and Medicine Hat. The Rockets were in every game they played and the team passed the character test with flying colours. Where do we start when it comes to the success of the team on the road trip? Look no further to the bottom six forwards who made a significant contribution offensively. Riley Stadel, Leif Mattson, Jack Cowell, newcomer Erik Gardiner and defensive defenceman Brayden Chizen were examples of players that found their name on the score-sheet when they traditionally play a secondary role. Not on this road trip though. Head Coach Jason Smith had to play four line hockey, for the most part, in an effort to keep the teams head above water with the schedule that looked daunting when it came out this summer. Is the road schedule as tough when you experience it first hand? Harder! The only saving grace is, in sports, winning heels all wounds and it lightens the mood despite the long hours on the bus and the shortage of sleep. If one player benefited more greatly from the absence of the teams top forwards on this road trip it was Jake Kryski. The 18 year-old was given a chance to be a top six forward at the start of the season but really never found his way into the hearts of the coaching staff with his play, Often inconsistent, Kryski knew this seven game road trip was a chance to get back into the good books. That is exactly what he did. Kryski scored six goals on the road swing, with another coming in the shootout (they don't count statistically) for the game winning goal against the Edmonton Oil Kings. Kryski now has 8 shootout goals to his credit in his career and has the ability to fool goaltenders with his quick hands. Michael Herringer has been a workhorse for the team this season and fatigue possibly started to show. The 20 year-old struggled in games in Lethbridge and Medicine Hat and was pulled in both in favour of Brodan Salmond. That opened the door for Salmond to start consecutive games while earning his first career shutout in a 3-0 win in Red Deer. The great part of the story is Herringer did bounce back with a great effort Sunday in a 2-1 shootout win in Edmonton. Herringer made several terrific stops and looked more like himself in the one goal win. The Comox, BC resident was money in the shootout stopping all three shooters he faced, including flaring out his right pad to stone Oil Kings forward Lane Bauer. Herringer is now 11 for 11 in shootout situations in his career. Did Kole Lind do enough to solidify himself as the WHL Player of the Week? Lind had a terrific road trip, but had his 13 game point streak snapped against the Oil Kings Sunday night. Lind had 4 goals and 10 assists for 14 points on the 7 game road trip. Lind has 46 points in 35 games this season and is on pace for a 90+ point season. The Rockets have now played a Western Conference high 21 road games. Only Saskatoon has played more in the WHL with 22 games away from their own arena. Erik Gardiner auditions for the team with four games during the road swing. It would be safe to say the 17 year-old impressed. While collecting 1+3=4 in those four games, Gardiner's play away from the puck was equally impressive. The coaching staff used him on the power play and the penalty killing unit and he didn't look out of place in both of those areas. Will Gardiner be invited back for the second half of the season or return to the SJHL's Humboldt Broncos? My bet is, if they can make room for him, Gardiner will be making his home debut with the Rockets on December 27th. The second half of the season begins December 27th against the visiting Kamloops Blazers. This will be the fourth of eight meetings between these two teams that are separated by only two points in the standings. Of the nine games after the Christmas break, seven of them will be against BC Division teams, including back-to-back games in Victoria in early January. At the half way point of the season, the Rockets are in the mix in the Western Conference. Could they make their 4th straight appearance in the WCF? Prince George and Everett are the clear favourites and have been consistent all season long. Both have few holes in their game. But with six games left before the WHL trade deadline, you would think a trade for a quality forward would give them an even greater shot of challenging the Cougars, Tips and even the Blazers in the fight for first place in the conference. Red Deer for a game against the Rebels. These two teams met back on October 8th with the Rebels earning a 5-0 win. The trip started last Friday in Tri City with a 3-2 overtime win. The Rockets bounced the Kootenay Ice Saturday night (7-3) before losing a heartbreaker to the Lethbridge Hurricanes on Sunday (6-5). The team then concluded five games in seven nights with an 8-7 overtime loss Tuesday in Medicine Hat. While the Rockets are 4-0-0-0 in the last five seasons against the Rebels in Kelowna, they are just 2-2-0-0 over that period at the Enmax Centrium. Rockets Review: Tuesday night, Jake Kryski (2+2=4) and Kole Lind (1+3=4) each had four point outings in an 8-7 overtime loss to the Medicine Hat Tigers. In the 15 goal game, the Tigers opened a 4-1 second period lead before the Rockets rallied to tie the score at four heading into the third period. The Tigers would again score back-to-back goals to take a 6-4 lead before the Rockets would again tie it. Leif Mattson, Cal Foote, Kyle Topping and Braydyn Chizen also scored, with the power play finding the back of the net on 2 of 5 chances. Michael Herringer started the game and was pulled after surrendering 6 goals on 21 shots. Brodan Salmond came in relief and allowed two goals on 14 shots. Road Rash: The road trip the team is currently on features 7 games in 10 nights with stops in Tri City (3-2 OTW), Kootenay (7-3 W), Lethbridge (6-5 L), Medicine Hat (8-7 OTL), Red Deer (Tonight), Calgary (Saturday Dec 17) and Edmonton (Sunday Dec 18th). Overall, the Rockets are 8-2-2-0 in their last 12 games and have points in 7 of their last 8 (6-1-2-0). Top Prospects: Defenceman Cal Foote and forward Kole Lind have been named to the roster for the CHL Top Prospects game. Foote is one of only two players on the Rockets roster to play in every game this season. The other is Rodney Southam. Lind leads the team in scoring. The Top Prospects game will be played in Quebec City. NHL Central Scouting has released its November ‘Players to Watch’ list. Defenceman Cal Foote is an ‘A’ prospect for next June’s draft. Kole Lind is a ‘B’ prospect. The NHL draft is in Chicago. Broadcasters Bits: Nick Merkley returns the lineup tonight after being released from Hockey Canada’s main camp on Tuesday….Erik Gardner made his Kelowna Rockets debut Tuesday night vs. the Medicine Hat Tigers. Gardner, acquired from Regina, laced up the skates for the first time in the WHL after playing the majority of this season in the SJHL with the Humboldt Broncos…Sixteen year-old rookie Liam Kindree also played Tuesday night with the team having 6 regulars out of the lineup. Kindree was playing his second WHL game after suiting up with the team in Vancouver/Langley earlier this season. Kindree is leading the BC Major Midget League in scoring….Calvin Thurkauf has 8 goals in his last four games and Monday was named the WHL Player of the Week for his antics…The Rockets are 4-1-2-0 in December...The Rockets were 6-4-0-0 in 10 games in November after going 8-4-0-0 in 12 games in October…The Rockets are the only team in the WHL that has failed to surrender a shorthanded goal against this season…The Rockets are 5-7-0-0 against BC based teams this season…The Rockets are 19-12-2-0 after 33 games. Last season the team was 25-7-1-0 after 33 games….Michael Herringer has started in 14 of the last 17 games and 20 of the last 24…The Rockets are 8-0-1-0 against U.S Division teams this season…The Rockets have carried the lead into the third period in 14 of the last 23 games while being tied twice over that period…The Rockets are the most penalized team in the WHL…Tomas Soustal (Czech Republic) and Calvin Thurkauf (Switzerland) are playing for their respective countries at the upcoming World Junior Hockey Championships in Montreal/Toronto.…Dillon Dube is attend Hockey Canada’s main camp vying for one of 22 spots on this year’s roster….The only December birthday is Cal Foote. Foote turned 18 on Tuesday. Who’s Hot? Jake Kryski has 4+4=8 in last three games and 6+6=12 in his last 6 games…Calvin Thurkauf has 8 goals in his last four games…James Hilsandager has a goal and three assists in his last five games…Tomas Soustal has points in 12 of his last 15 games. The 19 year-old has goals in 10 of his last 18 games and has 10+15=25 over that period… Kole Lind has points in 20 of his last 22 games (14+20=34)…Lind has goals in 9 of his last 11 games and is riding an 11 game point streak. Lind has 9+10=19 over that stretch…Nick Merkley has points in 14 of his last 19 games (8+13=21). Medicine Hat where they face the Tigers. 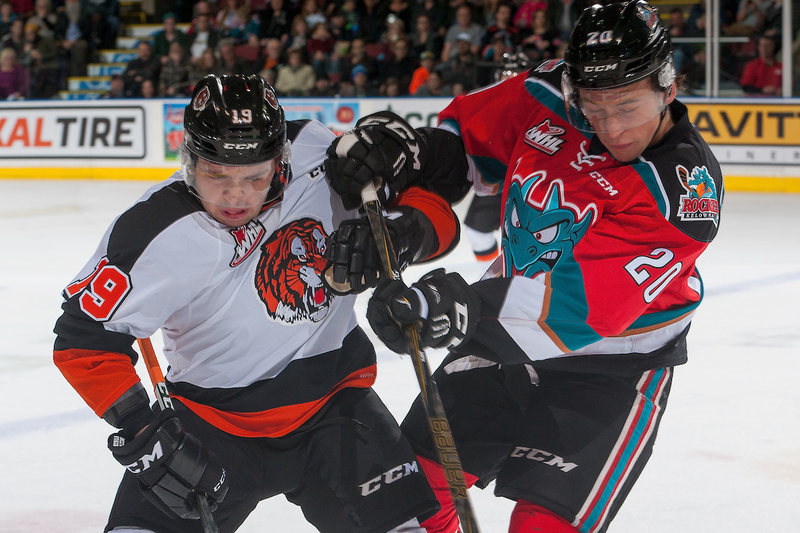 These two teams last met back on November 5th, at Prospera Place, with the Tigers earning a 6-2 win. Chad Butcher had 2+1=3 in the win while out-shooting the Rockets 40-25. The Rockets have had success in Medicine Hat over the years. The Rockets have not lost in regulation time here since 2010. It was December 14, 2010 when Tyler Bunz made 26 saves in the Tigers 2-0 win. Since then, the Rockets have earned a point in seven consecutive appearances and are 5-0-0-2 over that period. Last season, in their lone visit, the Rockets were a 6-5 winner (October 6/15). This is game four of a seven game road trip for the Rockets, who began the trip last Friday in Tri City with a 3-2 overtime win. The Rockets bounced the Kootenay Ice Saturday night, 7-3, before losing a heartbreaker to the Lethbridge Hurricanes Sunday night with a 6-5 setback. Rockets Review: Calvin Thurkauf scored twice in a 6-5 loss to the Lethbridge Hurricanes Sunday night. Connor Bruggen-Cate (1st WHL goal), James Hilsandager (1st as a Rockets player) and Nolan Foote also scored in the teams’ 12th loss of the season. The Rockets led the game 4-3 before the Hurricanes would strike for three straight goals. The Rockets were 1 for 3 on the power play while surrendering two goals against on four penalty kills. The visitors fired 43 shots on the opposition net. Road Rash: The road trip the team is currently on features 7 games in 10 nights with stops in Tri City (3-2 OTW), Kootenay (7-3 W), Lethbridge (6-5 L), Medicine Hat (Tonight), Red Deer (Fri Dec 16), Calgary (Sat Dec 17) and Edmonton (Sun Dec 18th). Overall, the Rockets are 8-2-1-0 in their last 11 games and have points in 6 of their last 7 (6-1-1-0). The team has won 4 of its last 5 games straight overall. Broadcasters Bits: Two players will make their WHL and Kelowna Rockets debuts tonight against the Tigers. Erik Gardiner, who is a 17 year-old forward playing with the SJHL’s Humboldt Broncos and 16 year-old Liam Kindree, who leads the BC Major Midget League in scoring, will be in the line-up. 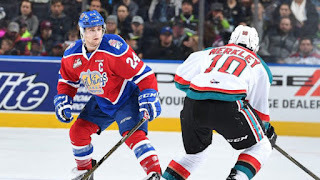 Gardiner was acquired from the Regina Pats along with James Hilsandager in the Jonathan Smart trade while Kindree is a 4th round bantam pick of the team from 2015…The Rockets have also recalled 16 year-old forward Ted Brennan. Brennan, from Victoria, has played four games with the team this season (0+1=1) and is a third round bantam pick from 2015…Calvin Thurkauf has 8 goals in his last four games and Monday was named the WHL Player of the Week for his antics…The Rockets have allowed, on average, just 27 shots on goal in their last 7 games…The Rockets are 4-1-1-0 in December...The Rockets were 6-4-0-0 in 10 games in November after going 8-4-0-0 in 12 games in October…The Rockets are the only team in the WHL that has failed to surrender a shorthanded goal against this season…The Rockets are 5-7-0-0 against BC based teams this season…The Rockets are 19-12-1-0 after 32 games. Last season the team was 24-7-1-0 after 32 games….Michael Herringer has started in 13 of the last 16 games and 19 of the last 23…The Rockets are 8-0-1-0 against U.S Division teams this season…The Rockets have carried the lead into the third period in 14 of the last 22 games …Veteran 20 year-old Michael Herringer was named the WHL Goaltender of the Week from October 17th to October 23rd. Herringer went 3-0-0-0, posting a goals against average of 1.99…The Rockets are the most penalized team in the WHL…Tomas Soustal (Czech Republic) and Calvin Thurkauf (Switzerland) are playing for their respective countries at the upcoming World Junior Hockey Championships in Montreal/Toronto.…Nick Merkley and Dillon Dube are attend Hockey Canada’s main camp vying for one of 22 spots on this year’s roster. Team Canada’s main camp runs until December 14th in Blainville, Quebec. Merkley was a late cut last year…The only December birthday is Cal Foote. Foote turns 18 today!! NHL Central Scouting: NHL Central Scouting has released its November ‘Players to Watch’ list. Defenceman Cal Foote is an ‘A’ prospect for next June’s draft. Kole Lind is a ‘B’ prospect while defenceman Jonathan Smart is a ‘C’ prospect. The NHL draft this year is in Chicago. Who’s Hot? Calvin Thurkauf has 8 goals in his last four games…James Hilsandager has a goal and two assists in his last four games…Tomas Soustal has points in 12 of his last 15 games. The 19 year-old has goals in 10 of his last 18 games and has 10+15=25 over that period… Kole Lind has points in 19 of his last 21 games (13+17=29)…Lind has goals in 8 of his last 10 games and is riding a 10 game point streak. Lind has 8+7=15 over that stretch…Nick Merkley has points in 14 of his last 19 games (8+13=21). Tonight’s Preview: We’re back! The Kelowna Rockets are back in Kennewick, Washington for the second time in 9 days for the final regular season game at Toyota Center. These two teams met last Wednesday with the Rockets earning a 4-1 win. Over the last five seasons, the Rockets are 12-2-0-0 against the Americans and 5-2-0-0 in their last 7 visits to the Toyota Center. The Rockets are coming off a 6-1 win over the Seattle Thunderbirds Wednesday night. Calvin Thurkauf scored three times in the win. Nick Merkley had three assists and was a +4 in the game. Michael Herringer made 21 saves as the team won for the 17th time this season. The Rockets are opening a seven game road trip. The trek features 7 games in 10 nights with stops in Tri City (tonight), Kootenay (Sat), Lethbridge (Sun), Medicine Hat (Tues Dec 15), Red Deer (Wed Dec 16), Calgary (Fri Dec 17) and Edmonton (Sat Dec 18th). Overall, the Rockets are 6-1-1-0 in their last 8 games. Broadcasters Bits: The Rockets have recalled 16 year-old forward Ted Brennan. Brennan, from Victoria, has played two games with the team this season (0+1=1) and is a third round bantam pick from 2015…Calvin Thurkauf’s three goals Wednesday snapped a 7 game goal scoring drought for the power forward…The Rockets have allowed, on average, just 21 shots on goal in their last four games…The Rockets are 2-0-1-0 in December...The Rockets were 6-4-0-0 in 10 games in November after going 8-4-0-0 in 12 games in October…The Rockets have lost 6 times on home ice, the exact same number of losses as a season ago when the team was 27-6-3-0 at Prospera Place…The Rockets are the only team in the WHL that has failed to surrender a shorthanded goal against this season…The Rockets are 5-7-0-0 against BC based teams this season…The Rockets are 17-11-1-0 after 29 games. Last season the team was 22-6-1-0 after 29 games….Michael Herringer has started in 11 of the last 13 games and 17 of the last 20…The Rockets are 7-0-1-0 against U.S Division teams this season…The Rockets have carried the lead into the third period in 13 of the last 19 games …Veteran 20 year-old Michael Herringer was named the WHL Goaltender of the Week from October 17th to October 23rd. Herringer went 3-0-0-0, posting a goals against average of 1.99…The Rockets are the most penalized team in the WHL…Tomas Soustal (Czech Republic) and Calvin Thurkauf (Switzerland) will play for their respective countries at the upcoming World Junior Hockey Championships in Montreal/Toronto.…Nick Merkley and Dillon Dube are attend Hockey Canada’s main camp Sunday December 11th vying for one of 22 spots on this year’s roster. Team Canada’s main camp runs December 11-14th in Blainville, Quebec. Merkley was a late cut last year. Who’s Hot? Tomas Soustal has points in 11 of his last 12 games. The 19 year-old has goals in 10 of his last 15 games and has 10+14=24 over that period…Calvin Thurkauf has points in 10 of his last 16 games (8+11=19)…Kole Lind has points in 16 of his last 18 games (11+14=25)…Lind has goals in six of his last seven games…Nick Merkley has points in 14 of his last 19 games (8+13=21). Trade Winds Blow: The Kelowna Rockets and Regina Pats completed a trade last Wednesday night. The Rockets acquired 19 year-old defenceman James Hilsandager and 17 year-old Erik Gardiner for 17 year-old defenceman Jonathan Smart. 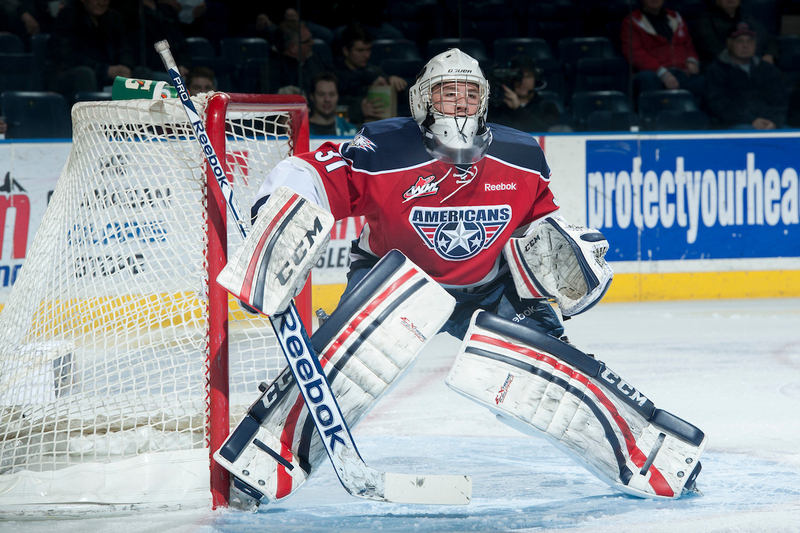 Gardiner was the Pats second round pick in the 2014 WHL bantam draft. Hilsandager was a 9th round pick. Smart was the Rockets first round pick in 2014. Gardiner is expected to make his Rockets debut during next week’s Alberta road trip. Goaltender Jordan Papirny was the best player on the ice for the Brandon Wheat Kings Saturday night in a 3-1 loss to the Kelowna Rockets. Had the 20 year-old been average, the Wheat Kings would have been embarrassed on the scoreboard. Papirny stood tall and kept the score close in the two goal setback. Nick Merkley scored twice, including the Teddy Bear Toss goal, as the home team cruised to their 16th win of the season. The Rockets owned the puck the majority of the night and the score could have been much more lopsided had the Edmonton product had an off night. At the other end of the ice, rookie goaltender Brodan Salmond was having a relatively easy night with a 17 save performance, which included a late third period penalty shot save on Wheat Kings forward Ty Lewis. Outside of a minor blip in a 2-1 loss in overtime Friday to the Spokane Chiefs, the Rockets clearly are resembling the type of team many people envisioned before the puck was dropped on the 2016-2017 season. This team, when all the horses are galloping hard, are not the middle of the pack team despite where they find themselves in the Western Conference standings. Merkley's Teddy Bear Toss goal was his first even strength goal of the season. Of the 8 goals he has scored this season, 7 have been on the power play. Merkley has 18 points, with only five of those coming even strength, The 19 year-old was named Saturday's 1st star. Everyone knows the biblical story of David vs. Goliath, but how about Belcourt vs. Jameson? The Rockets rookie 16 year-old defenceman was involved in his first WHL fight with Jameson, who is 3 inches taller and 45 pounds heavier. Belcourt surprised many, including Jameson, by sending the 18 year-old to the ice with several tactical right fists to the face. If you don't believe me, check out the highlites on the Kelowna Rockets website. Rockets rookie Connor Bruggen-Cate escaped serious injury when he was hit by Brandon's Barron Thompson at the conclusion of the second period. With pushing and shoving along the end boards inside the Wheat Kings zone as the buzzer sounded, Thompson, who is 6'5 and 255 pounds, came flying into the scrum of players and delivered a high hit on Bruggen-Cate. Thompson was ejected from the game but should receive supplemental discipline for his actions. Surprisingly, up until last night, Thompson had just 4 penalty minutes this season. Kole Lind had his 6 game goal scoring streak snapped. The second year forward had an assist though to extend his point streak to 7 games. Tomas Soustal earned an assist in the win. The 19 year-old now has points in 10 of his last 11 games. I liked the fact the coaching staff got Jake Kryski into the mix on the power play. They need too with four players (Merkley, Dube, Thurkauf, Soustal) being lost to world junior camps next week. Kryski will need to be used on the power play with those four absent from the line-up and the 18 year-old needs to get his mojo back. It was nice to see him find the back of the net for the 6th time this season. Heading into the Christmas break with just one more home game remaining, the Rockets had another strong crowd with 5,546 taking in the game. Tonight’s Preview: The Kelowna Rockets close out a two game U.S Division road trip tonight against the Spokane Chiefs. This is the first of four meetings between these two teams this season. The Rockets make a return visit on February 26th. The Chiefs make two appearances in Kelowna on January 4th and February 17th. The Rockets are coming off a 4-1 win in Tri City Wednesday night. Tomas Soustal and Kole Lind each had a goal and an assist in the win. Nolan Foote and Jordan Borstmayer added singles in the team’s 15th win of the season. The Rockets out-shot the Americans 45-21 and were 0 for 2 on the power play but were 3 for 3 on the penalty kill. Tonight’s game is the start of 8 of their 10 games before Christmas being played on opposition ice. The only home games over that stretch are against Brandon (tomorrow) and Seattle (Wednesday). In the last five seasons the Rockets are 8-2-1-1 against the Chiefs including 4-1-1-0 in their last 6 visits to Spokane Arena. 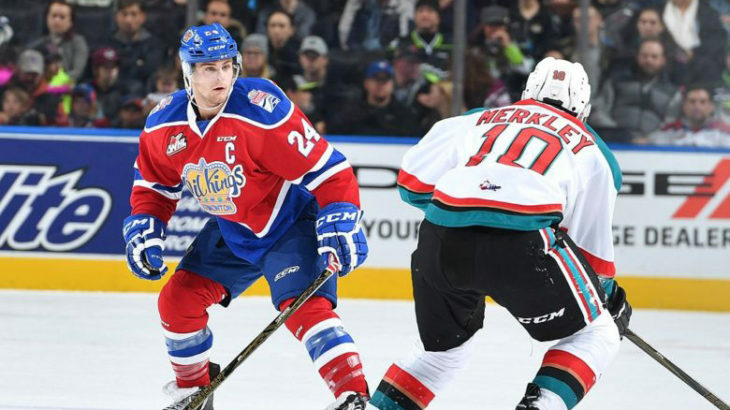 Trade Winds Blow: The Kelowna Rockets and Regina Pats completed a trade Wednesday night. The Rockets acquired 19 year-old defenceman James Hilsandager and 17 year-old Erik Gardiner for 17 year-old defenceman Jonathan Smart. Gardiner was the Pats second round pick in the 2014 WHL bantam draft. Hilsandager was a 9th round pick. Smart was the Rockets first round pick in 2014. Broadcasters Bits: The Rockets are playing the Chiefs for the first time since trading 19 year-old forward Tanner Wishnowski to Spokane October 17th for 16 year-old prospect Colum McGauley…The Rockets were 6-4-0-0 in 10 games in November after going 8-4-0-0 in 12 games in October…The Rockets are the only two teams in the WHL that have not lost in overtime this season….The Rockets have played a BC Division low 26 games…The Rockets have lost 6 times on home ice, the exact same number of losses as a season ago when the team was 27-6-3-0 at Prospera Place…The next time the Rockets face a BC Divisional cousin is December 27th when they host the Kamloops Blazers….The Rockets are the only team in the WHL that has failed to surrender a shorthanded goal against this season…The Rockets are 5-7-0-0 against BC based teams this season…The Rockets are 15-11-0-0 after 26 games. Last season the team was 19-6-1-0 after 26 games and 20-6-1-0 after 27 games….Michael Herringer has started in 9 of the last 10 games and 15 of the last 17…The Rockets are 6-0-0-0 against U.S Division teams this season…The Rockets have carried the lead into the third period in 10 of the last 16 games …Veteran 20 year-old Michael Herringer was named the WHL Goaltender of the Week from October 17th to October 23rd. Herringer went 3-0-0-0, posting a goals against average of 1.99…The Rockets are the most penalized team in the WHL…Tomas Soustal (Czech Republic) and Calvin Thurkauf (Switzerland) will play for their respective countries at the upcoming World Junior Hockey Championships in Montreal/Toronto.…Nick Merkley and Dillon Dube will attend Hockey Canada’s main camp December 11th vying for one of 22 spots on this year’s roster. Team Canada’s main camp runs December 11-14th in Blainville, Quebec. Merkley was a late cut last year…The Kelowna Rockets raised $7,554 dollars for men’s health during ‘Movember’. The goal was $5,000 dollars. Who’s Hot? Tomas Soustal is riding a nine game point streak. The 19 year-old has goals in 9 of his last 12 games and has 10+12=22 over that period…Calvin Thurkauf has points in 8 of his last 13 games (5+10=15)…Kole Lind has points in 14 of his last 16 games (10+13=23)…Lind has goals in five straight games….16 year-old Nolan Foote has points in 6 of his last 10 games. Foote has 4+2=6 over that period…Merkley has points in 12 of his last 16 games (6+10=16). Was it the Kelowna Rockets most complete road game of the season? If not, darn close. Tomas Soustal and Kole Lind each with a goal and an assist in a 4-1 win Wednesday night at the Toyota Center against the Tri City Americans. The Rockets discipline was as sharp as it's overall play as the team put together back-to-back solid efforts after an impressive 3-2 overtime win Saturday against the Regina Pats. The team took only three minor penalties, all in the third period, limiting the WHL's third best power play to only three chances with the extra man. Outside of a short flurry in the first period, the Rockets were clearly the better team 5 on 5. Kole Lind, Nolan Foote and Jordan Borstmayer added singles in the teams 15th win of the season. The Rockets are in Spokane Friday night. The shot clock was a good indicator of exactly how well the Rockets played. It was the greatest margin for the season as the Rockets fired 45 shots on net while surrendering only 21 against. Michael Herringer's best save came against Americans leading point producer Michael Rasmussen on a third period power play. The 17 year-old first round prospect has been held off the score-sheet in two games against the Rockets this season. Jake Kryski fighting? Yep. The 18 year-old found himself trading punches with Americans Brendan O'Reilly. I liked it. Kryski doesn't fight. It may have been his first tilt in the WHL and it showed something about his character. It showed that he plays with emotional and intensity, which isn't often evident in his body language on the ice. The fight was an encouraging sign for a player who often finds himself in ideal scoring areas but just can't finish. By my count, Kryski had three good scoring chances last night but came away empty handed. Kole Lind has scored a goal in five straight games. The second year forwards 14th goal of the season matches his total from all of last season. Tomas Soustal, the games first star, had a goal and an assist and is now riding a 9 game point streak. This won't be a popular opinion with WHL referee haters, but I thought the game was called exceptionally well by Jason Nissen and Mike Campbell. Both officials kept their whistles in their pockets and didn't make one soft call. Not one. They stayed out of it and the game took a quick 2 hours and 9 minutes to play. Jordan Borstmayer's goal was his first in 20 games. The second year forward has three goals this season, the exact same total in 61 games in his rookie campaign. The Rockets announce a trade with the Regina Pats late in the first period of last night's game. The team sent 17 year-old defenceman Jonathan Smart to the Pats for 17 year-old prospect Erik Gardiner and 19 year-old defenceman James Hilsendager. Smart was the Rockets first round bantam pick in 2014 while Gardiner was the Pats second round pick that same year. Gardiner is the younger brother of former PA Raiders sniper Reid Gardiner and was a Saskatchewan Midget Hockey League first team all-star with the Prince Albert Mintos last season. Hilsendager was the Pats 9th round bantam pick in 2012. The Lloydminster resident is expected to make his Kelowna Rockets debut Friday in Spokane. Dan Marr, the director of NHL Central Scouting took in last night's game in Tri City.